A study led by Manzar Ashtari, Ph.D., from the Children's Hospital of Philadelphia in Pennsylvania, and presented at the annual meeting of the Radiological Society of North America (RSNA) suggests that the inability of autistic children to relate to people and life situations in an ordinary way may be the result of an abnormally functioning mirror neuron system. 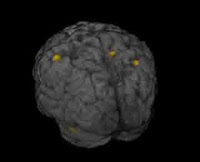 The study uses a novel imaging technique to study autistic children and found increased gray matter in the brain areas that govern social processing and learning by observation. The amount of gray matter in the left parietal area of the brain correlated with IQ in the control children but not in autistic children. Decreased gray matter in the amygdala region of the brain correlated with severity of social impairment. The abstract of the study Gray Matter Enlargement in Children with High Functioning Autism and Asperger Syndrome Using a Novel Method of Diffusion Based Morphometry is available on line. The study included 13 male patients diagnosed with high-functioning autism or Asperger syndrome and an IQ greater than 70 and 12 healthy control adolescents. Average age of the participants was about 11 years. Each of the patients underwent diffusion tensor imaging (DTI), a technique that tracks the movement of water molecules in the brain..
DTI is traditionally used to study the brain's white matter, as well as the brain fibers. However, Dr. Ashtari's team applied it to the assessment of gray matter by employing apparent diffusion coefficient based morphometry (ABM), a new method that highlights brain regions with potential gray matter volume changes. By adding ABM to DTI, the researchers can detect subtle regional or localized changes in the gray matter. 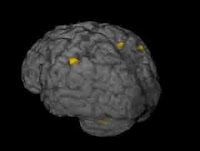 In addition to the gray matter abnormalities linked to the mirror neuron system, the results of this study revealed that the amount of gray matter in the left parietal area correlated with higher IQs in the control group, but not in the autistic children. "In the normal brain, larger amounts of gray matter are associated with higher IQs," Dr. Ashtari said. "But in the autistic brain, increased gray matter does not correspond to IQ, because this gray matter is not functioning properly." The autistic children also evidenced a significant decrease of gray matter in the right amygdala region that correlated with severity of social impairment. 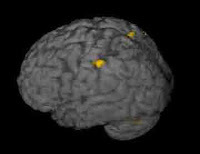 Children with lower gray matter volumes in this area of the brain had lower scores on reciprocity and social interaction measures. "Impairments in these areas are the hallmark of autism spectrum disorders, and this finding may lead to greater understanding of the neurobiological underpinnings of the core features of autism," said study co-author Joel Bregman, M.D., medical director of the Fay J. Lindner Center for Autism. Autism is the fastest growing developmental disability in the United States and typically appears during the first three years of life. Children with autism are hindered in the areas of social interaction and communication skills. According to the Centers for Disease Control and Prevention, as many as 1.5 million Americans have autism. 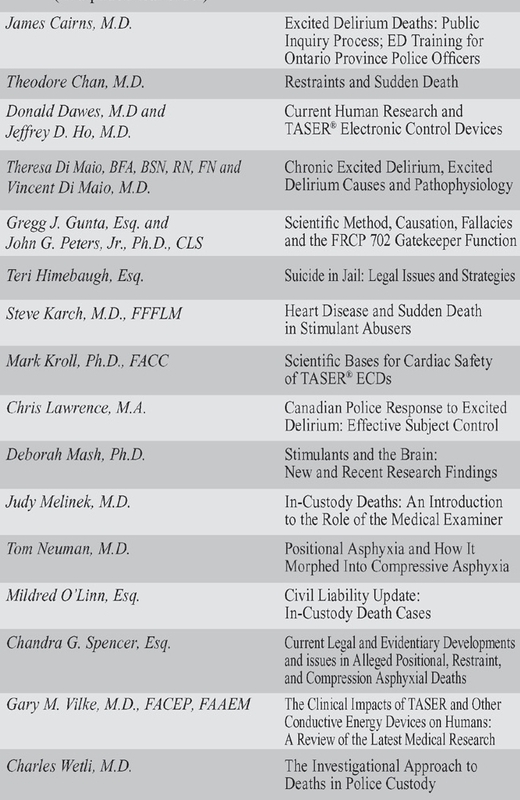 Co-authors are S. Nichols, Ph.D., C. McIlree, M.S., L. Spritzer, B.S., A. Adesman, M.D., and B. Ardekani, Ph.D. The Ontario Association for Behaviour Analysis (ONTABA) www.ontaba.org held their annual conference on November 15 and 16, 2007. The two-day conference provided an exciting opportunity for attendees to learn some of the most up-to-date and innovative methods of incorporating Applied Behaviour Analysis (ABA) techniques in various significant issues including autism. During the Awards Ceremony segment, retired MPP Shelley Martel was presented with an honourary lifetime ONTABA membership award in recognition of her outstanding dedication and commitment to families and individuals with autism and in supporting ABA in Ontario . Ms. Martel said that she is thrilled to continue her involvement with the autism community and feels that there is great merit in developing an accreditation process for professionals working in the field of autism and ABA . “This is necessary to assure parents that high quality treatment services are being delivered to their children and that the money being invested in recruitment, training and retention, is being well-spent,” said Ms. Martel. “Models of regulation have been developed in other jurisdictions and we should examine those models to determine what would work in Ontario .” When asked why it would be paramount for the government to recognize and work with ONTABA in this development process, she said; “Since ONTABA has the expertise in behaviour analysis, it only makes sense for the Ontario government to work with ONTABA in developing any such criteria." Malcolm Stanley, executive member of the Ontario Autism Coalition (OAC) www.ontarioautismcoalition.com made a presentation on day two of the conference for which he received a standing ovation. The presentation pointed out that the ONTABA brand is based in the quality of ABA service and that there are dangers in the organization not being involved in ABA implementation strategies in Ontario . "Appropriation of the ABA concept by politicians and unqualified service providers weakens not only ONTABA but threatens the overall quality ABA service provided to all Ontario children (with autism)", said Mr. Stanley. “The OAC strongly urges ONTABA to aggressively 'police' the use of ABA-based word marks and concepts in the Ontario marketplace”, he said. The OAC is also pushing for ABA to be implemented under the guidance of ONTABA member professionals and offered a number of possible solutions such as the development of a professional college. "A key step in this process is the achievement of an agreement with the Provincial government to put in place a college for ABA professionals and ensure proper credentialing of ABA service providers," he said. "This strategic goal must be achieved by ONTABA before school programs are set up which ignore or disallow the presence of ONTABA and its members." There was an abundant flow of energy throughout the two days. Indeed, it has been a remarkable year for autism in Ontario . There is no question that the newly formed relationship between autism advocates and ONTABA provides the critical backbone in the fight for the implementation of authentic ABA in our province. The first step in achieving this goal is for Ontario to embrace the existing international standards of board certification for those practicing ABA . However, qualifications specific to both autism and ABA expertise requires that the individuals overseeing the implementation of ABA for autism not only meet the international board certification standards, but that they also carry autism experience as outlined in the Autism SIG Guidelines for ABA Consumers http://www.behavior.org/autism/ABAAutismSIG_Gdlns_2007.pdf . The United Nations Third Committee has approved, without a vote, a resolution sponsored by Qatar, calling on the General Assembly to designate April 2 as World Autism Day. Qatar, as the primary sponsor of the resolution issued a press release which follows. It is encouraging to see autism issues being moved on to the world stage. This kind of attention should help encourage those national governments, including the Government of Canada, which are doing little or nothing to address the autism crisis in their countries. It is no surprise that Autism Speaks, with co-founders Bob and Suzanne Wright, is at the forefront once again, in raising autism awareness, with a focus on addressing the real needs of autistic children and adults. Congratulations and a note of appreciation to Qatar the nation which has been the primary sponsor for the World Autism Day resolution. Member States should break the “barrier of shame” of people suffering from autism and raise international awareness of the importance of early diagnosis and treatment of the brain disorder, which was estimated to affect 35 million people worldwide, Nassir Abdulaziz Al-Nasser, Permanent Representative of Qatar to the United Nations, urged this afternoon during a Headquarters press conference. “ Qatar shares the concerns of a number of countries about the high rate of autism in children in all regions of the world,” Mr. Al-Nasser said. His comments come almost a month after the General Assembly’s Third Committee (Social, Cultural and Humanitarian) approved a draft resolution, 1 November (see Press Release GA/SHC/3899), introduced by Qatar’s delegation and co-sponsored by 50 Member States, to designate 2 April as World Autism Day. Once the draft resolution is adopted by the General Assembly, as expected, the Day will be observed annually starting in 2008. Joining the Ambassador today was Bob Wright, co-founder of Autism Speaks, a United States-based non-governmental organization that works to raise awareness of autism and fund research for its causes, prevention and treatment. 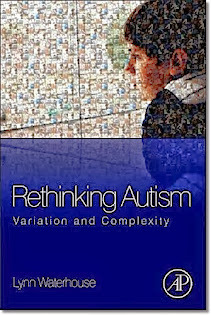 “Combating autism is going to require worldwide effort. It is not politically, geographically or economically centred. It is an equal destroyer,” he said. In the last two and a half years, Autism Speaks spent an estimated $60 million on scientific and medical research, he noted. In the United States, children diagnosed before the age of three and then properly treated had a 50 per cent chance of graduating from public school at an appropriate age level. However, many African-American and Hispanic children, and children from non-English-speaking households, were not diagnosed until age seven. Suzanne Wright, also co-founder of Autism Speaks, said 1.5 million people had the complex brain disorder in the United States, and a new child was diagnosed with it every 20 minutes. An immediate global response was needed to address the epidemic, she urged. During the Second Annual International Forum for Children with Special Needs held in Doha in April, Autism Speaks and Qatar’s Shaffalah Centre, which assists disabled children, announced plans to launch an Autism Speaks Programme in Qatar. Also during the press conference, Jacqueline Aidenbaum Brandt, a mother of an autistic son, shed light on her personal experiences, including the misconception society had of the brain disorder and the concerns of parents of autistic children. She said people often mistook an autistic child for an unruly or poorly behaved one, blaming the parent instead of the disorder for the child’s behaviour. Caring for an autistic child was complex, as parents were left to grapple with whether the child would one day be independent, and how he or she would be cared for after the parents had died or were no longer able to do so. For several years Andrew Kavchak, parent of an autistic child/child with autism, has campaigned relentlessly for a National Autism Strategy. As the father of an autistic child Mr. Kavchak understands the need for a National effort to address Canada's autism crisis. 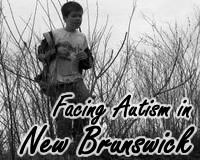 While movement appeared headed in that direction last year with the passage of the Andy Scott/Peter Stoffer private member's motion and the debate on Shawn Murphy's initiative, the momentum toward a National Autism Strategy has been stopped cold, as intended, by the neo-conservative ideology of the Harper government and Health Minister Tony Clement. In his polite letter to Health Minister Clement Andrew Kavchak draws on the example of our American neighbors to try and kick start the Harper government's feeble National Autism Strategy. Good luck Andrew. You will need it, or a change of government, to revive any prospect of a real National Autism Strategy in Canada. Please see the information below from the US government about its latest initiative in dealing with the autism crisis. Is there any chance that the Canadian federal government might take any similar action in recognizing the need for some federal leadership in developing a national autism strategy? You may recall that exactly a year ago the House of Commons voted in favour of a motion that called for the creation of a National Autism Strategy. The proposed strategy had four components...three of which involved consultation and cooperation with the provinces. Under your watch, no consultation or cooperation has happened so far...at least, none that is known to the community. Perhaps the creation of such a "new interagency autism coordinating committee" could prove useful in turning the empty words of the motion into meaningful reality and provide some hope for the community? 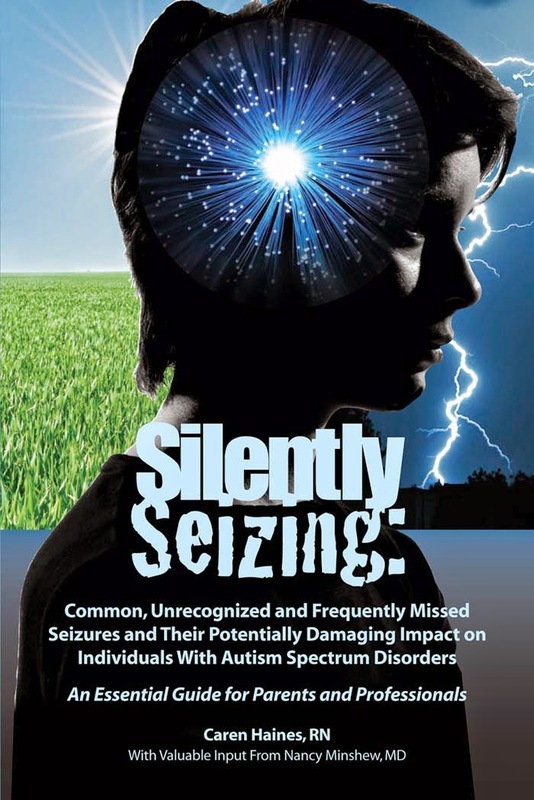 spectrum disorder through research, screening, intervention, and education. research, services, and education related to autism spectrum disorder,"
National Institute of Mental Health (NIMH) to lead this activity. The committee chair is Thomas R. Insel, M.D., director of NIMH. greatest difference for families struggling with autism," Dr. Insel said. passed, to seek the causes of autism and new treatments for the disorder. Development), is currently enrolling participants. understand the health of children, adults, families, and communities. policies that affect individuals with autism spectrum disorders. children with autism spectrum disorders. normal and diseased nervous system. and Training, National Institute of Environmental Health Sciences at NIH. supports research and research training in environmental health. M.D., M.P.H., director of the CDC, on the committee. particularly those who are poor or lack access to care. Elias Zerhouni, M.D., is director of the National Institutes of Health. A world renowned leader in the field of radiology and medicine, Dr.
pediatrics. Dr. Janvier is a fellow of the American Academy of Pediatrics. measures in her daily parenting and childcare routines. practitioner with 25 years of experience. Internship Program, and the KEEN Foundation. her long-term, personal experience with the disorder. is available at the NIMH Web site, http://www.nimh.nih.gov. information about NIH and its programs, visit http://www.nih.gov. Sometimes the news is good. 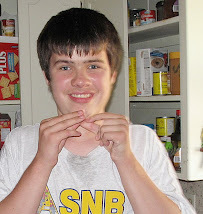 RCMP are reporting that a 17 year old youth with Asperger Syndrome who had gone missing without gloves or a toque has been found safe. He is receiving medical attention but is reported to be in good health. The anti-ABA ideologues who lobby incessantly to keep parents from gaining access to proven effective Applied Behavior Analysis intervention for their autistic children have produced some incredible excesses over the years. Particularly noteworthy is the ludicrous claim that helping autistic children by ABA methods infringes the civil rights of autistic persons. According to the anti-ABA internet crowd helping a child make the gains reported in the recent American Academy of Pediatrics autism reports is actually a violation of the human rights of autistic persons; an imposition of the values of the Neurologically Typical on autistic children. A comment today on Ed's Autism Page is so outrageous it deserves a new award "Autism's Worst Anti-ABA Rhetoric Award, 2007". Rather than accept public responsibility, overcomers of what are considered afflictions of thought, perception, or behavior, are glorified and if the one whose behavior is seen as "abnormal" cannot be punished in a way that society will readily agree with, the force that dictates the person's behavior must be seen as either demonic, provoked by disease, or promoted by genetic defect that must be eliminated. What is important to remember is that once a behavior can be described to the public as wrong instead of different, it can and does lead to the worst and most savage methods of the behavior modificationists. Those who modify behavior that is different in the justified name of "correcting what is wrong" go unpunished and their methods (once justified in this way) are not only accepted, they are promoted. These are the REAL wrongs that need to be researched, investigated, and fixed! It takes a lot to beat the rhetorical excesses of those who ascribe all manner of evil to allegedly misbehaving behaviorists but the host of Ed's Autism Page seems to have pulled it off. Is it possible to talk to the host of Ed's Autism Page and suggest that using behavior modification to eliminate self aggressive behavior by an autistic child is not really oppressing the autistic child ? 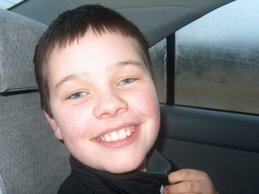 Autism Reality - What Happens To Our Children When We Are Gone? I may have been too quick when I mentioned the excellent Vancouver Sun feature Faces of Autism as one of the rare exceptions to the "feel good" avoid autism reality mindset of the mainstream media. In Who will care when the caregiver goes? the Toronto Star discusses the fear that haunt many parents of autistic children - what happens when we are gone? 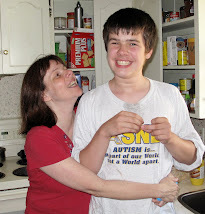 Who will care for our autistic children, where will they live, and how? Will they be happy? Despite significant media attention being paid to autism low functioning, truly low functioning, persons with autism remain invisible. The exception to this rule is the Vancouver Sun which provided the most comprehensive presentation of persons with autism from all points of the autism spectrum with its excellent Faces of Autism series. The Vancouver Sun, Pete McMartin, columnist, and Glenn Baglo, photographer, deserve full credit for daring to portray realities of life for persons from across the full spectrum of autism disorders and their families. I say they "dared" to portray these realities because of the hostility generated by image conscious ideologues who do not want the world to know that there are autistic persons with only a limited understanding of the world, of language and of everyday realities. The caring families of the Autism Every Day video know all to well what happens when the real challenges of autism are presented truthfully to the world. The Faces of Autism series remains one of the few competent commercial media treatments of the realities of truly low functioning autistic persons - other than news responses to horrific stories such as the middle aged autistic woman with no communication skills who was physically assaulted, repeatedly, by staff at a Long Island residential care facility until one staffer, assisted by videotape footage of the assaults, reported them and criminal charges responded. Another incident which elicited media attention to the realities of lower functioning autism is that of the Toronto woman who was allowed to starve to death while in the care of her adoptive sister. Generally though the lower functioning autistic persons are not featured on the major media networks, news magazines or newspapers. After all, news today is also entertainment and it is easier to sell feel good stories than address hard realities. Anderson Cooper distinguished himself during Katrina by speaking truth to power, by pointing out, when politicians were busy patting themselves on the back, that people were dieing all around them, on the streets and rooftops of New Orleans. But when it comes time to examine the lives of autistic persons Mr. Cooper and the good Dr. Gupta do not visit the invisible autistics, those who do not attend "autism conferences", write internet essays and make videos for world consumption. In CNN world, in Oprah world, in the world of the mass media generally, much good is done by highlighting autism and raising autism awareness. Unfortunately, for the largest media organizations, the realities of life for truly low functioning autistic persons are ignored. Mr. Cooper and Dr. Gupta do not see or visit the truly low functioning autistic persons who hurt themselves, who lack understanding of language or everyday dangers of life. For CNN and the big media organizations the faces of truly low functioning autistic persons do not show up on their cameras and our television screens, they remain invisible to CNN - and to the world. 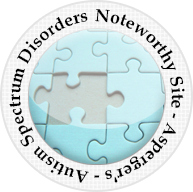 I want to take the opportunity today to thank the many Neurodiversity visitors that I have received on this blog site since it began 15 months ago. Neurodiversity is a very loose and somewhat fractured group or persons, largely internet commentators, who are opposed to efforts to cure or treat autism. And they have often criticized me specifically and other parent autism advocates seeking to help their autistic children. Even within Neurodiversity groups there is a significant divide between those ND members who acknowledge that autism is in fact a disability that restricts to one extent or another the lives of persons with autism and those who feel that autism is just another natural, in some ways superior, variation of the human condition. There are arguments over whether it is appropriate to use expressions like "persons with autism" as opposed to "autistic persons". Some argue that it is inappropriate to refer to autistic persons by common sense expression like "low functioning" or "severely autistic". 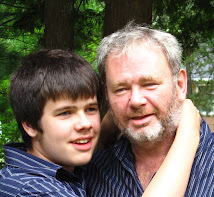 It is not clear how they would have us distinguish between people like my 11 year old son who has limited communication ability and limited understanding of everyday realities - and dangers - and those autistic persons, some self diagnosed, or diagnosed as adults, who write complex internet essays, testify before government bodies and court proceedings. But then their focus lies not with helping less fortunate autistic persons achieve positive gains in intellect, communication, knowledge, writing or understanding. To the contrary, what unites all members of the "Neurodiversity" movement is their opposition to attempts to treat or cure OTHER autistic persons, including autistic children. I have capitalized OTHER for a reason. No one is forcing adult autistic persons to undergo treatment. What unites the ND ideologues is their determined opposition to any realistic effort to help other peoples' autistic children. They can dress it up any way the want but the truth is that ND ideologues oppose ABA for autistic children; other peoples' children. ABA is an evidence based intervention demonstrated by the quantity and quality of evidence over five decades of research to be effective in helping autistic children make substantial, sustained gains in IQ, language, academic performance, and adaptive behavior as well as some measures of social behavior, and their outcomes have been significantly better than those of children in control groups. What unites the ND group is their opposition to the only method demonstrated to produce substantial, sustained gains in IQ, language, academic performance, adaptive behavior and some measures of social behavior for autistic children. This is what ABA has been documented by decades of research to offer autistic children . This is what ND icons like Michelle Dawson and Laurent Mottron opposed before the Supreme Court of Canada and the Canadian Senate. And what would these good citizens have parents do instead of helping their autistic children realize these gains through ABA? They want us to wait another generation, literally, to see how further studies turn out comparing ABA to other interventions with little or no evidence basis of efficacy. So WHY do I thank ND ideologues for visiting my blog site? Because when they do, when they write their "Harold Doherty says" and "Harold Doherty believes" etc. comments on their web sites they actually encourage their followers to visit this site. And if even ONE Neurodiversity believing parent visits this site, comes to learn what ABA can do for their autistic child, and is able to realize these gains for their child, then it will all be worth it. For that reason I would like to thank Michelle Dawson, Estee Klar-Wolfond, "Joseph", "Steve D", Kev Leitch and Mike Stanton. Contrary to your best efforts you might have actually helped some parents realize the truth about ABA and the benefits it can offer their children. PBS has long been a leader in constructive television programming for children. That tradition has been carried on with PBS Kids on television and on line. Autism is not a problem for Conor when he is having fun on line with PBS Kids. Conor has his own folder bookmarked on our house computers and has PBS Kids in his bookmark folder. One of his favorites is Pinky Dinky Doo and the Great Big Fancy Word Game which he enjoyed again this Sunday morning. When did Canada become a country in which police forces killed so many of its citizens and visitors? And when did the police in this country depart from the common sense and plain language which forms the currency of every day life in this country? Canada.com reports in RCMP to probe death of B.C. man days after Taser arrest that RCMP in British Columbia will probe the death this morning of Robert Thurston Knipstrom, 36, four days after he was pepper-sprayed, Tasered and hit with a baton in an altercation with police. A police release announcing the probe stated that ""Because of the possibility that the police use of force could have been a factor in the individual's medical injuries, the RCMP began the in-custody-related investigative protocols from the very beginning,"
A 36 year old man dies 4 days after being pepper-sprayed, Tasered and hit with a baton in an altercation with police and the official police statement talks about the possibility that police use of force could have been a factor in his injuries? No kidding. Following its consideration of the fourth periodic report of Portugal ... The Committee was worried that the use of TaserX26 weapons, provoking extreme pain, constituted a form of torture, and that in certain cases it could also cause death, as shown by several reliable studies and by certain cases that had happened after practical use. 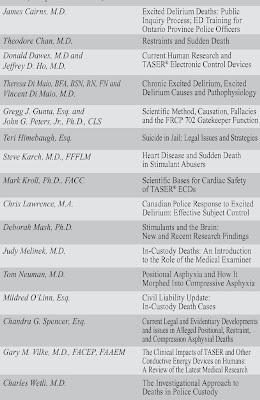 The Citizen article states that about 275 people in the United States have died after being Tasered and cites information from Amnesty International that coroners have listed the Taser jolt as a contributing factor in more than 30 of those deaths. If your autistic child engages in self injurious, self mutilating, or life threatening behavior would you try to prevent such dangerous behavior or allow it to continue? If you chose to eliminate the behavior how would you do it? if the choice is between drugging your child or using a behavior modification program employing a 2 second "bee sting" type skin shock what choice would you make? If the choice is between the skin shock aversive approach and continual medication what choice would you make? If the choice is between the skin shock aversive approach and persistent use of physical restraint what choice would you make? Aversives, in the form of a brief, 2-second skin shock to the surface of, typically, the arm or leg, are added to this treatment for only certain extremely difficult-to-treat behaviors that have failed to respond to positive-only treatment in the student’s previous placements as well as at JRC. The procedure feels like a hard pinch and, unlike the heavy and often ineffective psychotropic drugging that this procedure typically replaces, has no negative side effects. Rewards and educational procedures alone are tried for an average of 11 months at JRC before JRC considers the addition of aversives. In addition, the use of aversives has to be pre-approved, on an individual basis, by the child’s school system (through the IEP process), the parent, a physician, a psychiatrist, a human rights committee, a peer review committee and a Massachusetts Probate Court judge. Currently,only a minority of JRC’s school-age students receive skin shock as an aversive and even in these cases its use is very infrequent, less than once per week in the average case. In many cases the student progresses so well with this treatment that the aversives can eventually be removed entirely and the student can be returned to his/her local school system. I subsequently received some feedback from parents who used aversives to help end serious self injurious behavior in their autistic children including testimony of some parents before a committee of the Legislative Assembly of Ontario. I am re posting all of this testimony in its entirety and I ask that anyone reading this comment take the time to consider this testimony carefully and with an open mind. My name is Sue Handon and my daughter Crystal is a JRC student. She came there 3 years ago because every other school that she attended had failed to help her. She has Smith-Maginis syndrome. When she is maintaining self control she is the sweetest person you could ever meet. But when she is out there emotionally she is a danger to herself and others. Crystal is deaf in one ear and severely impaired in the other due to self injuries to her ear. She is speech impaired, learning disabled, mentally retarded and emotionally disturbed. She has bitten herself so much until she has dark scar patches on her arms, hands and legs. She boke out windows and tore doors off hinges. The only solution offered me was medication to the tune of 10 different types daily. She became a guniea pig for Drs. Prior to her admittance to JRC she weighed 175 pounds. It was suggested that I start her on insulin because she started showing signs of diabetes. To date Crystal has lost most of the weight, she is on no meds and doing well. This is because she has finally gotten a true Behavior Modification Plan. It is not easy as a parent to make the decision to agree to this type of treatent but it was necessary. Though I understand people's reactions to my choice of treatment I don't understand the lack of understanding for us as parents being placed in this position to make such choices.We have all tried many methods but this is the one that is working. None of us would hurt our children. We are just seeking help for them. I was an elementary school teacher and my wife a school social worker when our son was born. 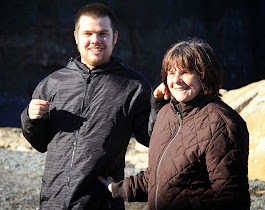 Although we both had worked with children with challenging behaviors, we were not prepared for those that our son exhibited. "M" has high functioning autism with severe obsessive-compulsive behaviors. 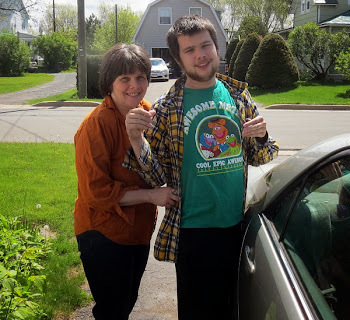 Only desperation compelled us, with our extensive background in the mental health/educational field and a deep love for our disabled son, to use a treatment that causes pain, albeit minor, but those medications our son took caused much pain and were not successful. It is difficult for those who do not have a severely disabled child to understand the desperation parents feels when they lose hope. 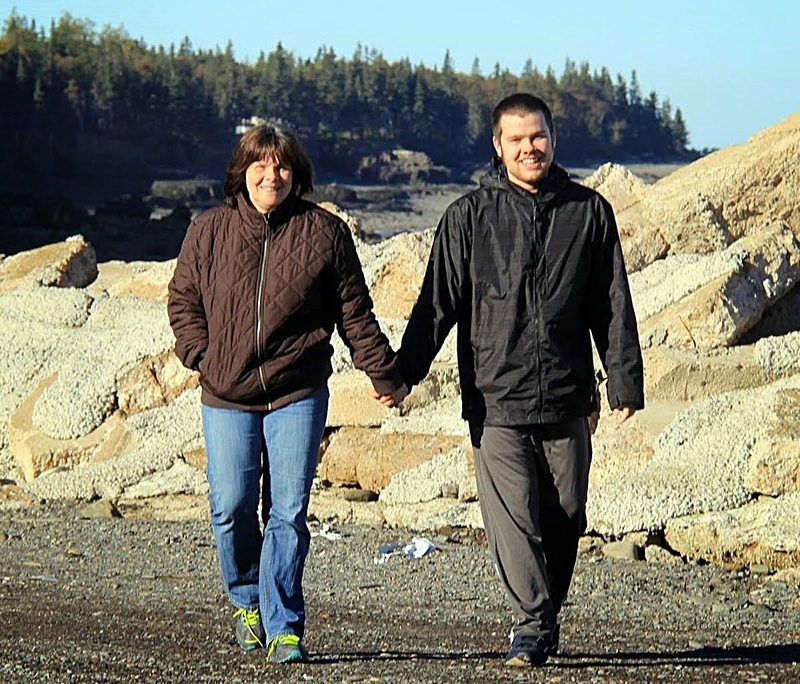 To make a long and painful story short, M has been to several prominent psychiatrists on autism, numerous medications, reward-only programs, counseling, a special education day school and two out of state residential facilities. In fact, one residential facility dumped him into a psychiatric hospital because they could not control him. They had all failed! Before we consented to have M receive the skin-sting therapy as a supplement to the extensive rewards program at JRC we tried it ourselves. We were skeptical that it would even work given our son’s challenging behaviors. However, within a couple of days of starting the treatment his major behaviors (aggression, property destruction and noncompliance) were drastically reduced. Even though “it doesn’t hurt that much” (his words) it helps him control himself and he receives applications very infrequently. M has continued to grow and progress in the last four years and is now recently received a high school equivalency diploma. This is from a student who made no academic progress in his three years of conventional residential schooling. Specifically JRC was able to get him to school on time, wear his glasses, do homework and have his behaviors under control in class so he could learn. Ours is just one of many, countless success stories and so we ask - Why would anyone want to take a school like the Judge Rotenberg Educational Center (JRC) and shut it down? Where would the students go? Those other places failed them! When M’s first residential school failed, the clinical director told us that if his second placement also failed, we should find a place where he would be comfortable (no demands) because that’s what she would do. Don’t we as parents have the right to decide if we want to warehouse our child on medication or give him a chance with a skin shock treatment? administered; close supervision by an experienced psychologist; periodic reviews be done by outside professionals of any students with whom the GED has been employed for two or more years, and termination of aversive therapy as soon as it becomes unnecessary. The parent association also has its own lawyer. As you can see, the parents of the children at the school have not abandoned them. Rather, they have chosen the best possible treatment plans for them. Please note that parents are not compelled by the state to send their children to JRC. If they do have their children attend the school, they do not have to sign for the use of the temporary skin shock treatment. Furthermore, they can withdraw their consent at any time. We do not see the use of a harmless two-second-skin sting, with no negative side effects, used on the average of once a week, and ended as soon as behavior improves, to be “cruel treatment.” It is a small price to pay to literally save lives, prevent self-mutilation and to give our children a quality of life they would have nowhere else. Having our children heavily medicated with ineffective psychotropic drugs, restrained for long periods of the day, placed in isolation rooms and warehoused “to control unpredictable spontaneous’ dangerous behaviors is the alternative our children face. We view that as cruel treatment! 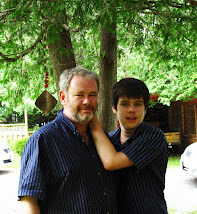 I am the parent of a almost 15-year old boy with PDD, who has been attending JRC for over 2 years. Everywhere I read posts aout JRC, all they seem to focus on is the skin shock. No one is up in arms about the major crisis in this country that has our children being drugged with DANGEROUS psychotropic medications! These drugs have never been tested on children and continue to cause SERIOUS health problems, and even death. How come no one addresses this? I don't see any politicians going up against the current medical establishment who are little more than drug pushers. It makes me sick when I think about how many drugs my son was forced to be on with side effects such as abnormal liver function, high cholesterol, severe weight gain, seizures, hallucinations, suicidal & homicidal thoughts, paranoia, and psychotic episodes. Most people don't know this but if you refuse to put your child on these drugs they can and will take you child away from you, and charge you with neglect. Before JRC, my son was attending a school for Emotionally Disturbed children. He spent most of his time in a padded room, due to his frequent aggressive outbursts. He was drugged out of his mind and couldn't learn. The doctors had him on a minimum of 3 psychotropic drugs at a time. The school district had a 30-day outpatient evaluation done on him at a psych hospital where he received no less than 1 shot of Haldol a day. It was their conclusion that he be placed in a long term institutional facility. Essentially lock him up and throw away the key. To me that was insane. Give up on my 12 year old son? No way! I was fortunate to find out about JRC and get him admitted there. He's been off the drugs for over 2 years now, and has made immense progress. His head is clear and he has caught up academically. His outbursts have decreased in frequency from several a day to once every 1-3 months. He told me he never wants to go back on those drugs. Back to my point: WHY IS NO ONE BEING CHARGED WITH CRIMINAL CHARGES FOR DRUGGING OUR CHILDREN?????? I have identical twin brothers with severe life-threatening behaviors extreme and rare even for persons on the autism spectrum. I have been practicing psychiatry over ten years and I specialize in persons on the autism spectrum. I recently completed an autism fellowship. Yet, I have only seen a handful of cases which can be classified as severe as my brothers. My daughter is also autistic. She is five, nonverbal but I am thankful she does not have the behaviors which my brothers exhibited, although I am in tremendous debt paying $90,000 for one year tuition for her school, plus speech, occupational and physical therapy. For her first month of school I had to drive her every morning and start my job at 11 AM, leave at 7:30 PM, get home at 9PM and do the same the next day. Thank goodness my extended family has been supportive. Her school does not employ the use of aversives and she does not need it. I did try to get her into a public school which was appropriate for her, but they only accepted seven children from all of New York City last year and my daughter ended up on the lottery wait list. When I attended the lottery there were many parents in tears. If NYSED (New York State Education Department) truly cared about these children there would be an appropriate placement for each and every child. Public school programs here many times are not providing the services which are in the child's federally mandated Individual Education Plan. New York City public school autism programs are also using methods with no scientific evidence such as the Miller method and the Option method when there are methods with scientific evidence. Using an invalidated method when there are validated methods to treat a condition is unethical. I do not understand how people can take NYSED reports seriously when many of their own public schools are not in order. almost twenty years. Before arriving there he banged his head so severely he had to have surgery to close it. He would bang his head suddenly, even during the night without a clear reason. He was in a hospital for over five months, and my parents were told his insurance was running out and they would have to flip the bill. He had no education in the hospital because he attacked the teacher. 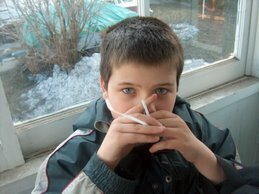 He also became very sick from the medications used to try to control his behavior. He had obesity, drooling, sedation and tardive dyskinesia. At one point he could have died from neuroleptic malignant syndrome from his haldol. The medications did not control his behavior. In the hospital he had one to one at all hours and he still needed repeat suturing for repeated head banging. The board of education requested my parents waive my brother's right to an education. They said there was no place which would take him. My mother found out through her internist about the Judge Rotenberg Center. We got him transferred within a few days of the insurance running out. He was taken off all his medications there although he still has permanent tardive dyskinesia. He is happy there and states he wants to "stay at JRC forever." 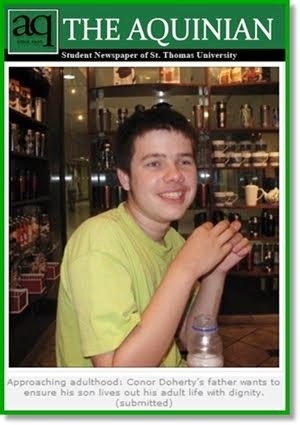 He enjoys the reward store and going on trips such as the zoo, museums and special olympics. I am calm to put him in the back seat of my car with my small children and take him out. (Prior to arrival at JRC he would attack my mother while driving). He does receive skin shock on average once to twice a month. At times he will actually ask to wear the device because he knows it gives him boundaries. Most of all, head banging is a thing of the past. 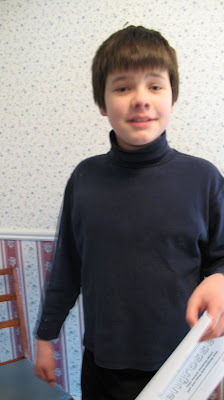 when he was in his structured and consistent day school program before he was 21 or when he had his job. I feel for some of my patients who have behavior problems and they just get suspended or terminated from their day programs. They are home, some possibly dangerous and overwhelming their caregivers beyond belief. My parents tried different approaches to my brothers, even took them to a doctor in Europe for a treatment. My grandfather spent about half his life savings to finance the trip. There is no medication which has shown to be 100% effective to control behavior like my brothers have. Positive behavior interventions are not sufficiently effective in all cases to suppress problem behaviors and there is a meta-analysis in 1999 that clearly shows this. As far as other methods proposed such as TEACCH and sensory integration, I think they can be helpful for some symptoms but they have never been shown to sufficiently treat the types of behaviors my brothers' have. In fact a small study on sensory integration resulted in an 11% decrease in the frequency of self-stimulatory behaviors. This does not cut it for a life threatening condition. However, there have been 111 peer reviewed articles on behavioral skin shock. I received the New York Medical College Award for Academic Excellence for my research on medication and behavioral skin shock to control life-threatening behaviors in persons with mental retardation or autism. Medication can sometimes be helpful but results are mild to moderate to decrease frequency of behavior. Behavioral skin shock gets on average an almost 100% decrease in frequency of behavior in subjects. My brother would be dead without this therapy and my other brother is dying. Imagine if you had an illness requiring surgery to your head and you were told this illness could be otherwise treated with a two second skin shock once or twice a month (which is my brother's average). Imagine if you had to give yourself repeated insilin injections and you were losing your eyesight or having a heart attack (side effects of medications plus more) and someone told you that these illnesses can be prevented and you can live years longer with a two second skin shock once or twice a month? Perhaps you rather have disease or injury. Perhaps not. Whatever you may decide, only my brother's family has the right to make that kind of decision for him. To have a family member with special needs is stress enough. To be in financial debt is more stress and to have to deal with life threatening behaviors is even more stressful. I find the criticism directed toward the Judge Rotenberg Center to be further stressful. I feel my family is being judged and marginalized after all we have already been through. Mr Gregory MacKinnon: Thank you, Mr Chair. Our submission has specifically to deal with subsection 66(12). I'll just start. Honourable members of the standing committee, we thank you for allowing us to address you here today. We are here as parents and we have lived in a world that, fortunately, few parents see. Our daughter, Katelyn, suffers from severe self-injurious behaviour, and we don't use the word "severe" lightly. In late 1992, when it was clear that Katie was not responding to the usually effective methods of dealing with her SIB, we were forced to make decisions that few parents must make. We could restrain her physically for 24 hours a day, with straitjackets and tie-downs. We could chemically restrain her and risk organ damage and other side-effects that neuroleptic and anti-psychotic drugs cause. We could place her out of the home, or we could use the SIBIS, the self-injurious behaviour inhibiting system. We decided to use the SIBIS. It was prescribed by Katie's paediatrician, a caring and knowledgeable man who treated her for all the usual childhood conditions in addition to her self-inflicted wounds. The SIBIS delivers a small shock to the fatty part of Katie's thigh when she hits or bites herself. The shock is localized to the thigh and is more startling than painful. Had Katie been born 20 miles to the east, and subject to the provisions in Bill 108 and Bill 109, we have no doubt that today Katie would be totally incapacitated by restraints, she would be sedated into complete inactivity, institutionalized, or worse. Instead, Katie is a happy, healthy 11-year-old with severe autism. To better understand what would lead parents to make a decision like this -- to use an aversive device like the SIBIS -- and to put that decision in context, you should be aware of Katie's life so far. Katie was diagnosed with autism at about two-and-a-half years of age. We were of course devastated. But she was happy and healthy and we thought we could help her function at her best with the help of supplemental programs and supports. It was immediately clear that Katie would have many of the stereotypical behaviours like hand flapping, rocking and infrequent eye contact. We learned to accept those behaviours while trying to help her develop her potential strengths. We knew we would have to be resourceful in recruiting professionals to help Katie, in the fields of mental health, education, medicine, physical therapy and speech and language. We would like to relate some of the therapies we've tried and the interventions to help Katie navigate better in this world. Some of them did help her to a minor degree, some of them did not. None of them hurt her directly. Some were before the onset of her SIB and some after. We took Katie to holding therapy twice a week for about two years. Holding therapy is based on the theory that the mother-child bond was somehow broken and that forced holding would help repair that bond. Holding therapy has since faded as the demand for efficacy data has increased. At about the same time, we heard about sensory integration. It seemed to us that this could be a real help to Katie. If in fact she was being bombarded with sensory input, SI could help desensitize her, thereby allowing her to make better sense of the world. We took her to a registered occupational therapist trained in sensory integration for over a year. Neither of these therapies benefited Katie very much, if at all. We hired a private gymnastic coach, who worked with Katie at least two times a week for three years. This did help Katie develop gross motor skills, coordination and strength. Between the ages of three and seven, Katie had three speech and language pathologists who worked with her on various types of communication, including sign language, facilitated communication, pointing and gesturing, picture identification and portable computers with voice synthesizers. Katie always had the ability to pull us by the arm and point to what she wanted, but we wanted to expand this ability so that other people would understand what she wanted. We had Katie in play therapy and music therapy, with so-called normal peers. We tried Katie on Ritalin, on the advice of a neuropsychologist who herself was a high-functioning autistic. That trial kept Katie awake and agitated for 24 hours. Katie was enrolled in a cross-categorical classroom with higher-functioning kids so she'd have good role models. It was in this classroom that Katie began having aggressive episodes, and as the school year went on, the episodes got more intense and more frequent. We took Katie to the University of Michigan child psychiatric clinic for about a year, hoping that Dr Luke Tsai's staff could help us find a reason for the aggressions and a way to help Katie control them. The treatment there consisted mostly of facilitated communication and a regimen of Anafranil. The facilitated communication was fruitless, as Katie would never use it at home, and the Anafranil made Katie more agitated. We looked into allergies as a possibility for Katie's worsening behaviours, possibly an environmental allergy or food allergy. The environmental allergist told us we were in the wrong pew if we thought Katie's aggression and self-injury were a result of something in her environment. We decided to try a yeast-free diet, thinking that it couldn't hurt and maybe it could help. We were wrong. That diet led to an eating disorder that still rears its head from time to time. We found that Dr Bernard Rimland was recommending megadoses of vitamin B-6, with magnesium and a natural substance called DMG, as a possible remedy for self-injurious behaviour. Not so with Katie. Dr Rimland later told us that behaviour worsens only in about 3% of the children. Katie was unfortunate enough to be in that 3%. Just before Katie's seventh birthday, her self-pinching and wrist-biting accelerated dramatically. She also started slapping herself in the head more and more often. At first, we were advised to ignore these behaviours, as paying attention to them might reinforce them. That made sense to us. The problem was, it didn't work. Katie would pinch, bite and hit herself even when alone, so attention-getting didn't seem to be the motivation for these increasingly dangerous behaviours. While we were trying to find a reason for Katie's self-destructive behaviours, they were becoming more and more ingrained and we were losing our little girl. By sheer accident, we found that Katie would hit less, albeit not much less, if she wore a hat. She started wearing a hat constantly and would not go without it even in the summertime. Shortly after she starting wearing the hat, she started hitting harder and faster, as if to defeat whatever protection the hat was providing. She then grabbed a hood that was unzipped from the jacket and wanted to wear that over the hat. Then we saw the same process of the hitting becoming harder and harder. When the hat and the hood together were no longer protecting Katie, we reluctantly bought her her first helmet. Shortly thereafter, she would hit the helmet with all her force. Our hearts broke to see Katie bashing the helmet that she depended upon so much. She couldn't live without the helmet, but she wasn't living with it either. We were learning what is meant by restraint dependence. Katie's SIB was worsening, even as we added more restraints. She was now wearing stiff arm restraints that didn't allow her to bend her elbows so that it would be harder for her to hit herself, but they also denied her the ability to feed and toilet herself. We were still looking into physical reasons for Katie's SIB, putting her through CAT scans, MRIs, X-rays and blood tests. All of these tests showed that Katie's only physical problems were self-inflicted. In addition to looking into possible physical reasons, we took Katie to Western Michigan University psychology clinic, where Dr Patricia Meinhold, a clinical behavioural psychologist, evaluated her and began working with us on behavioural approaches to Katie's SIB. That relationship continues to date, and Dr Meinhold is now a paid consultant for the school district as well. Wanting to know more about current medications used to combat SIB, we made an appointment with Dr Leonard Piggott, a well-known psychiatrist who worked in the field of autism for 30 years. Dr Piggott reluctantly informed us that there was no effective drug for the behaviours. He could only offer anti-psychotics and sedatives. We later tried Benadryl and Catapres at Dr Piggott's suggestion. It turned out that Katie's reaction to almost every drug is the opposite of the desired effect. By late 1991, Katie's helmet wasn't serving its purpose any more. She was hitting it hard enough to break off most of her hair, resulting in large bald spots and abrasions at the back and sides of her head. Katie even smashed the shell on one helmet with the force and intensity of her blows. Her eyes were constantly blackened and swollen and she had bloody, open sores on both of her cheekbones. Her wrists were bitten down to the bone and her upper arms had divots from where she chewed the skin. The bandages we applied to her arms just became more targets for Katie, as she chewed through them. The arm restraints also lost their usefulness, as Katie could bite into her upper arms, and banging her head on walls, door jambs and tile floors would take the place of her own hits. When both arm restraints and helmet were in place, Katie started biting her knees and ankles. There just wasn't any way to protect every inch of Katie from herself. In February 1992, we were at our wits' end. Katie was alternating between living on a two-inch-thick gym mat in our living room and a padded, sectioned-off section of her classroom, being carried to and from the bus kicking, hitting, screaming and biting by as many as four people. The school had used gentle teaching and worked from books like Progress Without Punishment for well over a year, and now it seemed all we had accomplished was delaying the inevitable. One day, the school called to say Katie was out of control again and they were afraid she might do permanent damage to herself. We knew this was serious, because Katie's school would never admit they couldn't control her. We picked her up from school wrapped in a blanket and drove directly to Ann Arbor and admitted her to the child psychiatric ward of U of M Hospital. That was the first night Katie ever spent away from home, and it tore us apart. At about 9 o'clock that evening we called to see how Katie was doing and were informed by the nurse that they had given her 25 milligrams of thorazine and she was sleeping. Apparently, there was fine print in the admissions form that allowed them to use their discretion on medication without consulting us. Katie was still groggy from the effects of the thorazine at 2 o'clock the next afternoon. When we asked what the plan would be for finding the root of Katie's SIB, we were told only that, "Here at U of M we medicate, and we medicate aggressively." There would be no behavioural plan, no plan to enhance communication, only medication. We didn't want Katie sedated into submission, so we had her released. For two years, we had tried the proven methods of extinguishing Katie's SIB. We tried positive reinforcements, we blocked hits, we redirected Katie's attention from the self-abuse. Katie was always overly praised when she wasn't self-injuring. The problem was that those times were becoming fewer and of shorter duration. Katie would hit and bite herself for six hours at a time, stopping only when her strength was completely depleted, but the slightest noise or movement, even the dog walking by, would start the cycle all over again, day after day after day. In the summer of 1992, we hired tutors to work with Katie on a daily basis, hoping that the consistency might help her get herself together before the school year started. But Katie's self-injury now had a life of its own, and it was taking over hers. She could no longer bring herself to go outside and play on her swings and trampoline that she once cherished. She could make it only as far as the patio, where the urge to bash her head into the brick wall of the house overcame her. Sadly, we sent Katie back to school that September in much the same condition that she left there the previous June. By October 1992, Katie was hitting her head and face at a rate of 5,500 times per hour. Her wrists and upper arms were festering sores. Katie was refusing to walk at all, having to be carried wherever she went. She was back in diapers, undoing two years of toilet training. Katie was eating about every third day, refusing even treats in between. She had lost six of her 54 pounds and her ribs showed through her skin. Sleep only came to Katie when she was completely exhausted and then only two or three hours a night. A daily chore at our house was to soak Katie's blood-drenched nightgown in bleach. When giving Katie a shower in the evening, my wife would roll up her pantlegs and stand in the shower with her to prevent her from slamming her head into the tile while I tried to wash her and clean her wounds. My wife and I watched helplessly as Katie's physical and mental health deteriorated to the point that it endangered her eyesight and even her life. It was like watching our sweet daughter get into a terrible car accident every day. At the end of October we decided to try the SIBIS. We knew of the SIBIS for about a year, but always thought we would find some less extreme way of dealing with Katie's self-injury. When we made this decision, we were well aware of the ramifications. We knew that reasonable people would disagree with us. We were sure the anti-aversive faction would come out of the woodwork to condemn us. Katie would get no services from the state of Michigan, as there is a directive prohibiting aid to families who use the SIBIS. Of course, we knew that the school district would not allow it in the classroom, even though their own consultant, Dr Peter Holmes from Eastern Michigan University, later told them that it was the most humane thing they could do. But we had to help Katie, because she had lost the ability to help herself. Her SIB was consuming every waking hour. The SIBIS trial took place on the last weekend in October 1992 at Western Michigan University psychology department. Dr Patricia Meinhold and some of her graduate students volunteered to conduct this trial. That three-day weekend changed Katie's life, and ours. Katie immediately responded to the SIBIS. The two-hour drive home from Kalamazoo at the end of the weekend was amazing. Katie smiled, looked around and ate snacks the entire way. We hadn't seen her smile in what seemed like a year. Katie seemed as if a tremendous weight had been lifted from her. In the next few days, about 99% of the hitting stopped. We later started using the SIBIS for the arm and wrist biting, and that too stopped almost immediately. Katie's face, wrists and arms were healing and she was eating and regaining her lost weight and she was sleeping through the night. My wife and I were overwhelmed. It was so wonderful to have our Katie back. We thought she was gone forever. We can now sleep through the night without hearing the sickening moan Katie used to make as she bit her wrists and arms through the night and the terrible slap, slap, slap that would inevitably follow. It has now been more than three years since we started using the SIBIS and Katie is injury-free, her hair has grown back and she is healthy and happy, as you can see from the front of this. Katie no longer wears arm restraints, bandages or helmets, and she only wears hats or hoods when the weather demands it, just like the rest of us. But the scars Katie carries from those days are a constant reminder of how horrible and cruel life can be to a little girl. We aren't here to say Katie's life is perfect now. She still has many serious deficits, both social and cognitive, and the tendencies towards SIB still appear from time to time. Katie has many obstacles ahead of her, but with the freedom from the SIB that the SIBIS provides, she can concentrate on overcoming them, instead of the obstacles overcoming her. Finally, it's obvious that Bill 19 won't affect Katie or our family. We are here now because there is now, or will be, a Katie in Ontario, and she'll deserve the best quality of life her parents can give her. There is, or will be, Canadian parents who will have to face the decisions we faced. There won't be many. Our family is the only one we know of in Michigan, but there will be one or two, and it would be a shame if that Katie was denied effective treatment by a well-meaning government trying to protect her. If in the course of these readings you come upon people who refer to themselves as advocates for children or advocates for the disabled who oppose the decisions we've made for our daughter, please ask them if all the so-called non-aversive treatments combined have a success rate of 100% in stopping self-injurious behaviour. When they answer no, please remember Katie's story and think of the beautiful face on the front of this submission. My wife and I again thank you for allowing us to address you here today. The Chair: Thank you, Mr MacKinnon. We have three minutes each caucus. Mr Duncan: Thank you for your presentation. I don't have any questions. Mrs Boyd: Thank you very much for coming and for sharing that with us. It takes a lot of energy to do that. I'm curious about the prohibitions within the state of Michigan and in your school district. Do they still pertain? You are still having to use this on a private basis? Mr MacKinnon: The SIBIS is with Katie in school now, after negotiations, and the state still has a directive prohibiting aid to families who use the SIBIS. Mrs Boyd: Can you tell me on what basis they put that directive in place? Mr MacKinnon: I don't remember the wording they used, but it's an aversive treatment. Mrs Boyd: They prohibit aversive treatment. Mr MacKinnon: Yes, they prohibit it. Mrs Boyd: One of the suggestions that has been brought to us in the past is that perhaps, given that there are very few people who are shown to be helped by this kind of treatment, the option might be to have a process whereby the kinds of other treatments have all been tried and can be shown, to a court or to a capacity and capacity board, that they have not worked and that then there is that check and balance. Do you think that's a reasonable position for a government to take? Mrs Denise MacKinnon: Within a time frame. Mr MacKinnon: Yes, it depends on the time frame. Katie didn't have that long. Had the process been, say, a three-year process, plus appeals that the state would do or whatever, Katie didn't have that long. Mrs Boyd: No, it would have to be a shorter process, but you did now about it for about a year before you tried it, so there would have been a period of time in there for you to look at that as a possibility. Mrs MacKinnon: Which we did. Mr MacKinnon: -- a lot of the methods earlier because they were just standard methods that worked for most kids. Mrs Boyd: The problem for us is that we have had psychologists appearing in front of us who seem to believe this should be generally available to lots of people. We certainly had one yesterday in London who uses this in his office on a regular basis and seemed to think it was unreasonable for there to be any kind of prohibition against this. I gather you really believe that this should be available as a last resort in cases like yours, rather than generally available for behaviour control. Mrs MacKinnon: Right, and with our daughter, it's a prescription from a doctor. You can't just go to Radio Shack and buy it. Mrs Boyd: No, no one was ever suggesting that, including the psychologist, believe me. Mrs MacKinnon: Some people don't realize that it is a prescription. Mr MacKinnon: It is not a device to be used for hand-flapping or rocking back and forth. Mr MacKinnon: I don't think a parent would allow that. I give parents more credit. Mr Klees: Thank you very much for your presentation. Perhaps you could, for the benefit of the committee, just give a very brief description of what this procedure does and how it works. Mr MacKinnon: If she's in an agitated state, she'll pick it up off the desk and hand it to us. Mr Klees: And have you felt this shock yourselves? Mr MacKinnon: Oh, certainly, more than she has. Mr Klees: Could you compare it for us? What would it feel like? Mrs MacKinnon: Like a light socket. Mr MacKinnon: It's less than-you know, when every kid puts their finger in a light socket, it's less than that. Mr Klees: Okay, we've had presentations from a family whose son benefits from faradaic stimulation. The story is very similar to yours. As you know, the previous law in this province restricted that use and this bill allows that to be used. I'd like to get your thoughts as well, because we have had presentations before this committee from advocates who oppose this and would like the previous law to stay in place and in fact, in their presentations, refer to this as cattle prods. I take personal offence at that terminology. I'd like to get your reaction to those who call themselves advocates for vulnerable people, but choose to use that terminology in this context. Mr MacKinnon: I think it's very divisive, especially in light of the fact that we have more in common with those people than we have differences with them. We have this one difference with them and Katie is the beneficiary of this one difference and we get called names. We've been called worse than just using a cattle prod. It's a shame it has to come down to that. Of course, we take offence at it, but we've learned to live with it and we probably will have to live with it for a while. Mrs MacKinnon: It's so rare that a child would develop this extreme behaviour. A lot of these people are passing judgement and they don't know us, they don't know Katie, they don't know what treatments we use, they don't know what doctors we've gone to. How our child suffered. We agonized over this decision, because we knew the ramifications, we knew these people would come after us, but we had to save our daughter's life. Mr MacKinnon: And we knew that what I think is called ARCH here -- no services from them, we knew that. We knew all of the ramifications. We knew that Katie would not get services, that we wouldn't get respite, that there would be no help from any government agency over there. Mr Klees: So the prohibiting legislation in Michigan certainly caused your daughter a great deal of pain and agony over a number of years. Mr MacKinnon: It did and it cost her in time, pain, and it's still costing her in services that she should be eligible for. Mr Klees: We commend you for your courage. The Chair: Thank you, Mr and Mrs MacKinnon. Not only is your love for your daughter, Katie, evident, but for the unknown children and parents who are agonizing at this moment of the same ailment.